The governing body of the U.N’s Clean Development Mechanism (CDM) has agreed to allow the most energy efficient coal-fired power plants to earn carbon credits under the scheme, causing outcry from green groups who claim the carbon market could be overrun by millions of low-quality offsets. The CDM Executive Board’s decision to lift its ban that prevented coal plants from seeking credits could allow some 40 projects, mostly based in China and India, to earn Certified Emission Reductions (CERs). The credits are awarded to projects that cut emissions of greenhouse gases and can be used by companies and governments to meet carbon reduction targets. The Board approved six coal plants for CDM registration before agreeing in November 2011 to suspend and review the methodology that outlines how many credits the schemes could earn, effectively stopping new projects from earning credits. While it is always good to use a resource more efficiently, this move has potentially negative consequences for the very issue it is setting out to address, a reduction in the total emissions of CO2 to the atmosphere. In this instance the CDM is not acting as a carbon pricing mechanism, rather it is simply incentivizing energy efficiency. In a recent paper written by a colleague (featured in a July posting), the secondary impacts of energy efficiency policy as a climate change response are explored. This particular action by the CDM Executive Board falls right into one of the problem areas. The paper presented the argument that energy efficiency action on its own could actually result in an increase in CO2 emissions. The diagram below explains this. On the vertical axis is the cost of providing an energy service, such as electricity. At the margin, this may be driven by non-fossil provision operating within the economy, such as a wind farm or the like. 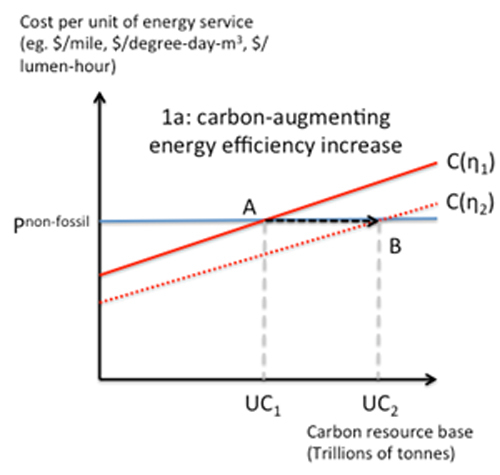 On the horizontal axis is a measure of the available carbon resource base. As the price of non-carbon alternative energy rises or falls, so too does the long term availability of the fossil alternative for a given technology set. At high alternative prices, more money is available to spend on expanding the fossil resource and vice versa. As the fossil resource expands, the cumulative number of tonnes of CO2 emitted will also grow, even if it takes longer for this to happen. Assuming a given alternative cost of providing electricity (pnon-fossil), the more efficient the power stations that burn coal, the more the electricity provider can ultimately afford to pay for the coal that is used. As more coal is used and the price rises (all other things being equal), so the resource base expands (from UC1 to UC2 in the figure above) and so does cumulative CO2 in the atmosphere. Further, as the CO2 issue is basically an atmospheric stock problem, this then drives up long term warming, even if the rate at which CO2 is emitted happens to fall in the short term. From a climate finance perspective the CDM has been a successful mechanism, albeit with some significant operational difficulties. It has paved the way for carbon pricing in many countries and has been an important catalyst for change in some areas (e.g. landfill methane). But subsidizing more energy efficient coal fired power plants, while well intentioned, may in fact have negative environmental consequences. The CDM needs to act in its purest sense, which is as a carbon price in the energy system of true developing economies. N.B. Just prior to posting this, a colleague noted that the Executive Board may have only allowed the issuance of CERS against already approved projects to proceed, rather than allowing future projects to apply by releasing the current hold on the underlying methodology. Hopefully this is the case, but in any case the argument still stands. Also the money from carbon credits would go to the coal producers rather than CCS and so called green energy producers. Anyway, under high price CO2 scenario it makes sense to become more energy efficient anyway. This include option to move production to the countries who don’t implement carbon tax. Actually, rather than carbon tax the overall level of taxation is important. As EU already has high taxes it is yet another reason to move production away. So Shell just follows overal trend.